Misdemeanors that allegedly arise in Rochester Michigan are alleged lower tier violations of local Rochester ordinances, Michigan State statutory law, and the laws of the United States (Federal laws). Frequently charged and ticketed misdemeanor offenses in Rochester Michigan include (but are not limited to): Drinking and driving (OUI, DUI, Super drunk, etc. ), failure to stop at an accident, possession of drug paraphernalia, DWLS (Driving While License Suspend/Revoked/ or Denied), assault and battery, domestic violence, and retail fraud. For most Rochester Michigan related misdemeanor convictions, the maximum amount of jail possible from your Judge (which is dependent upon the nature of the conviction) is a maximum of anywhere from ninety days to one year. Only a small select number of Rochester related misdemeanor charges require mandatory minimum sentencing; most misdemeanors do not mandate or force your Judge to order any form of incarceration. In many instances you can completely avoid serving time in jail with strong, dedicated legal representation. On top of jail, the Judge assigned to your case is always able to impose very strict, demanding, and expensive probationary provisions that may make your life difficult to manage. Failure to comply with a sentence is a recipe for jail. The Judge cannot control some consequences if conviction is entered for certain offenses (even if your Judge is sympathetic to you and your situation), including: the loss of your ability to work in a hospital setting caring for patients (various fraud/theft related crimes, drug crimes, and assaultive crimes); loss of your hunting and fishing privileges for years (some Department of Natural Resources conservation offenses); the loss and/or restrictions to your ability to legally drive (DUI/OWI related offenses and driving without a license related offenses); the inability to lawfully posses and/or purchase guns (stalking, domestic violence); etc. If you are not a citizen of the United States you must always proceed with strong immigration legal representation, because a misdemeanor conviction can lead to severe and irreversible immigration sanctions such as deportation, inadmissibility (inability to lawfully return to the United States if you ever leave the United States), immigration detention, and the inability to obtain waivers and other immigration relief. due process of law trial related rights (the presumption of innocent for any and all criminal offenses that you are facing, to have a contested trial in front of a jury (or in front of the Judge if the parties and the Judge agrees), to fairly and fully cross examine all prosecution witnesses, right to subpoena witnesses for your defense to testify in Court, prosecution has sole burden of proving its case against you beyond a reasonable doubt, right to remain silent and not have your silence used against you in any type of way, right to testify and tell your side of the story, seek potential appellate review of your conviction). If you are convicted, it will be up to your Judge to decide upon different allowable misdemeanor sentencing options. Before the sentence is rendered, the Judge will give you and your lawyer a chance to speak in court. The legal strategy and defense tactics you choose to pursue, only have real value and meaning if your lawyer is fully invested in providing you with the best defense. You can take control of your life and seek a leading Rochester defense lawyer to contest your misdemeanor, because your defense is only as strong as its weakest link. Does Rochester legal counsel who is both necessary and key to my defense have a professional local office where I can confidentially discuss my concerns? Does Rochester legal counsel who is both necessary and key to my defense appear before my District Court Judge on a regular basis? The answer all of these questions is yes, if take the step to invest in your defense and hire Rochester Michigan misdemeanor defense counsel Daniel Hilf. You do not need to settle for a second rate lawyer who just goes through the motions to appear like he or she is defending you. You do not need to settle for a lawyer that you do not completely trust to provide you with a compelling defense. 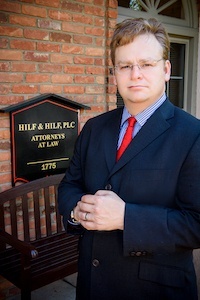 Being on top of his game, legally talented, well respected, clever, quick witted, and intelligent are all applicable descriptive terms for Rochester lawyer Daniel Hilf. If you have a 52/3 Court matter, contact us today to prepare for your strongest defense.